Earth by day, Space by night - Two Globes in one! 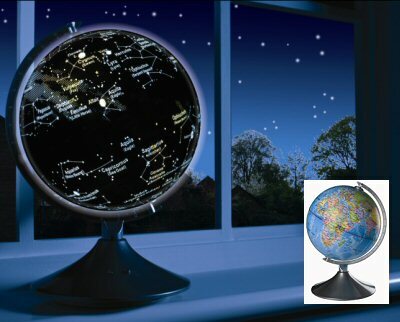 Our Constellation Globe shows the earth by day, and space by night - two globes in one! the perfect bedroom accessory for children who wish to learn about the secrets of the night sky in a very intersting way. By night the illuminated star map shows all the major constellations, enabling you to navigate the night sky. A light sensor automatically turns the globe to the illuminated night view when it gets dark. A fascinating tool for both geographers and astronomers alike. 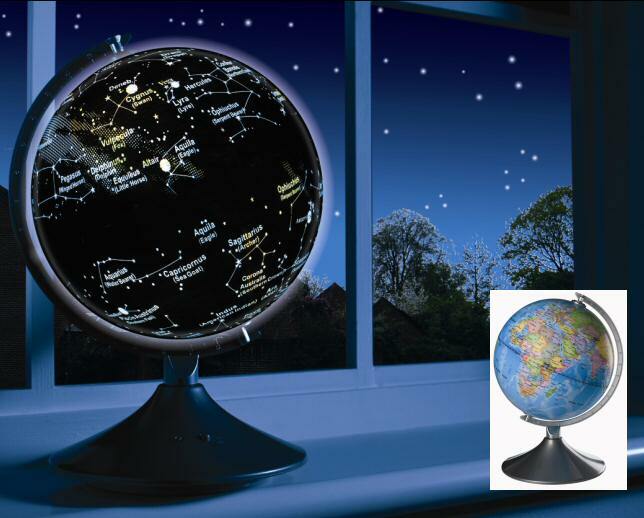 This beautifully crafted globe has a light sensor mounted on the the elegant stand allowing automatic internal illumination, transforming the globe from a detailed geographical globe into a map of the stars and constellations. All major constellations mapped for you. Light sensor mounted on base. Detailed map of stars and constellations. The globe size has increased – the previous version was 21cm diameter. The new globe is 22.8cm. It might not sound a lit but it does make a big difference when you sit them side by side. Also the globe base and stand is now in a cool silver style. In the night-time view, significant improvements have been made, so that the words are much clearer; the words and constellations really punch out. An on/off button helps to preserve battery life and give more flexibility. So if the button is in the “on” position when the ambient light reduces to a certain level, the night-time view will automatically switch on via the light sensor. If you want to switch off the night-time view in a dark room, then they can by pressing the button to the “off” position – this then overrides the light sensor.